It’s hard to pinpoint what makes this image so direct and powerful. Perhaps it’s the symmetry of the piece, and the way all the elements conspire to draw the viewer’s gaze to the centre. Or it might be the clean, geometric shapes, shaded in an uncluttered, Art Deco style. 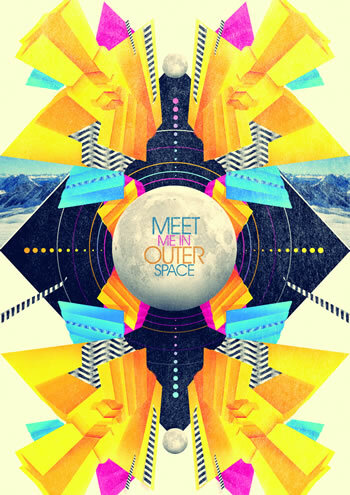 Maybe the colour palette, with its CMYK simplicity and Nu-Rave overtones, has something to do with it. Or is it the way it combines a classic 1960s Retro-Futurist feel – complete with space-age images – with a slightly textured backdrop, hinting at the hand-made? In this great tutorial, graphic designer Danilo Rodrigues shares a wealth of techniques that you can use to add some of this graphic’s oomph and impact to your designs. Open Adobe Illustrator and create a new document, sized 600-x-600mm or thereabouts. We’ll start by creating the abstract vectors to use in our composition. For this, create a grey rectangle (we’ll colourize them afterwards in Photoshop) sized 17-x- 385pts. 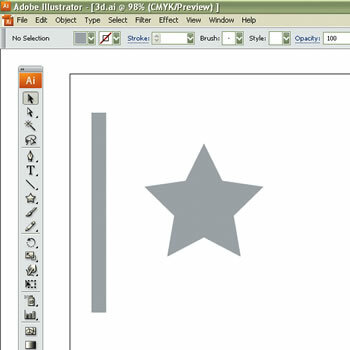 Try to make other forms, such as a star using the Star tool. Now, click Effect > 3D > Extrude Bevel. 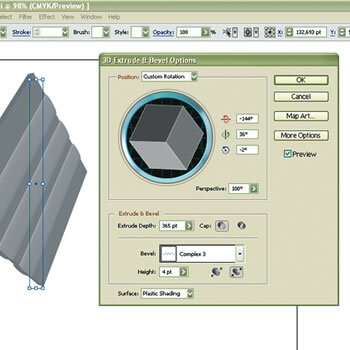 As in this picture, set the Extrude Depth to 365pt and set the Bevel to Complex 3, with a height of 4pt. Set the angles however you like; on this abstract vector, I set x to -144º, y to 36º and z to –2º.